And so the plan finally comes to fruition. I was surprised that they actually allowed the bomb to set off, but I also couldn’t think of a good way for them to disarm it, so I guess there weren’t many other options. I personally have no problems with an ending like this. The plan worked despite the sacrifice of the main characters. I think I’ve said before that bittersweet endings are my preference and that I don’t get overly attached to main characters. All in all, not a bad show. Probably the only thing I found questionable was the whole ordeal with Five, but whatever. I also question Lisa’s role in the show, but I guess it was for the feels or something. I don’t really like the comparisons I’ve seen between this show and Death Note, saying that it’s a better “Death Note”, but I guess people are free to believe what they want. So Five was just after a childish competition with Nine after all. Why did she admit defeat this week, though? Was it just because she realized that her body was almost dead? Or did she lose in some other way? Despite all that happened this week, there was never a reunion for Nine and Twelve, so we still don’t actually know what the nature of their relationship is right now…Nine could still be pissed. It looks like the atomic bomb has been set to blow by Nine as a final resort. I’m curious who will be the players in trying to stop it from detonating. Shibazaki is obvious, but will Twelve join in to save Lisa? And will something cause Nine to also join in on stopping the bomb? I guess Shibazaki hasn’t been doing all too much up to now, so it would be about time for him to shine. So the facility was meant to develop geniuses by inhibiting other abilities like communication? It’s certainly an interesting idea. I’ve always thought that there has to be some sort of balance keeping human capabilities in check. It looks like Five was the only “success” while Nine and Twelve escaped…but what did that guy mean when he said they didn’t have much time left? Does the drug they used shorten lifespans or did he just know they’d eventually be captured and killed? Either way, Twelve has betrayed Nine to save Lisa, but Five is still unable to collect the bomb. I guess now all that remains is finding out whether Nine is willing to forgive Twelve and work with him again or whether he’ll just continue the plan on his own. He seems like the type to do the latter, but we’ll see. Also, Five’s collapsing at the end of the episode…is that meant to indicate that the drug is taking its toll on her? Presumably, she’s had the most exposure to it after all. 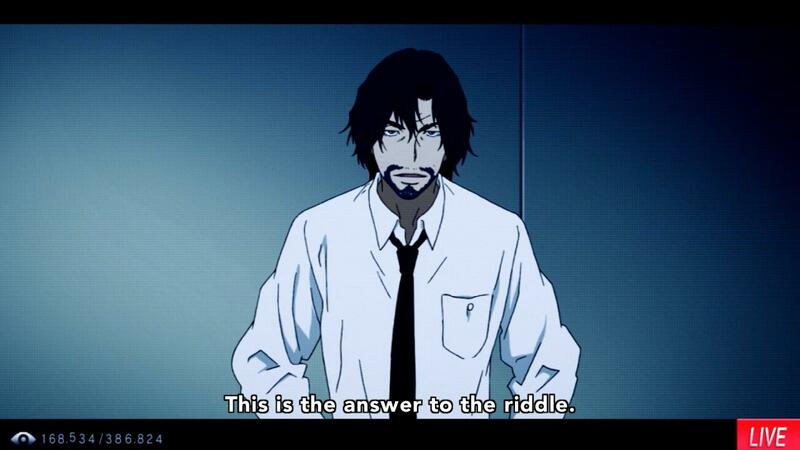 Zankyou no Terror Episode 8: What is Twelve headed toward? Back after a week off and the episode is fairly slow. It looks like Shibazaki is trying to get close to the organization responsible for raising all of these numbered kids. Presumably this Athena program is the start of everything. On Lisa’s end…well, at least she realizes how much of a liability she is to Sphinx. Unfortunately, that doesn’t stop her from continuing to be one. Twelve is rushing to save Lisa, into what is obviously a trap. Part of my mind is considering the possibility that this will be the end for Twelve, leaving Lisa to deal with an upset Nine, but that’s mostly just an unlikely hunch. Presumably, Nine will get over himself and go help Twelve with the rescue operation. Author marthaurionPosted on September 5, 2014 Categories Zankyou no TerrorTags explosions, terror in tokyoLeave a comment on Zankyou no Terror Episode 8: What is Twelve headed toward? It looks like Lisa will probably become more of a liability than a help now that Five has her identity. What’s her next move going to be? And given the interaction in this week’s episode, will the story shift to focus on Five’s moves and Sphinx’s responses to them? Or will Sphinx be able to once again regain the initiative? If so, how will Shibazaki fit into the picture? It looks like Lisa might be useful as a fresh face for this game against Five. Based on Nine’s strange flashbacks, it looks like Five tried to escape the facility from their past with Nine and Twelve, but was left behind for some reason. Does she hold a grudge? Based on her behavior, it looks more likely that she’s just become so demented that she wants a challenge which can only be provided by Nine and Twelve. How exactly is Nine planning on using Lisa in this game? It doesn’t look like she has a radio or transmitter of any kind, so how is she supposed to locate the bomb? Maybe she has some alternate goal that was discussed off-camera and will be revealed next week. Or maybe Nine has no intention of using Lisa at all and just let her go to make her feel better…that seems unlikely, though. 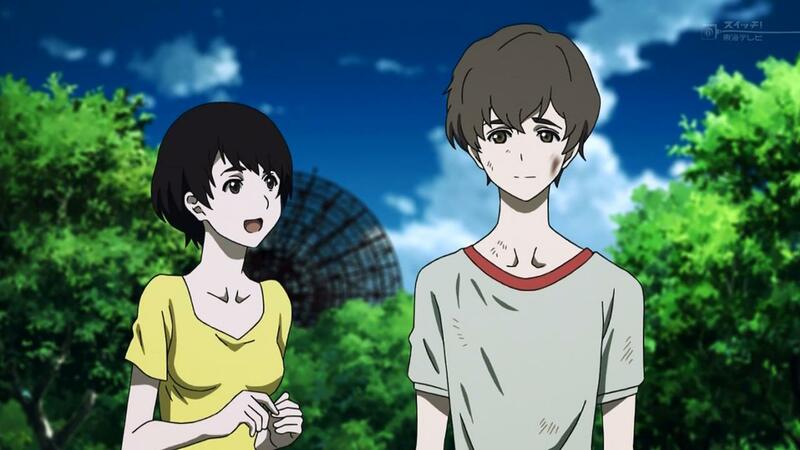 Zankyou no Terror Episode 5: Shibazaki’s competitor? It looks like the police have gained an ally from the secret facility that raised Nine and Twelve. Five was able to completely outsmart Nine this week, but I wonder just how recurring that will be. It’s possible that Nine was just too flustered from being caught off guard to react appropriately. Another possibility is that the numbers indicate some sort of ranking and Five really is just better than Nine, and maybe Lisa is going to have to be used to outsmart her. Lisa’s proven herself completely useless so far, but maybe she’ll get her chance next week. Also, what does all of this mean for Shibazaki? Surely he wouldn’t be pushed aside just because there’s a new character here to face off against Sphinx, right? But do we really see him working well together with Five? Author marthaurionPosted on August 8, 2014 Categories Zankyou no TerrorTags explosions, terror in tokyoLeave a comment on Zankyou no Terror Episode 5: Shibazaki’s competitor? Zankyou no Terror Episode 4: Lisa joins? Author marthaurionPosted on August 1, 2014 Categories Zankyou no TerrorTags explosions, terror in tokyoLeave a comment on Zankyou no Terror Episode 4: Lisa joins? 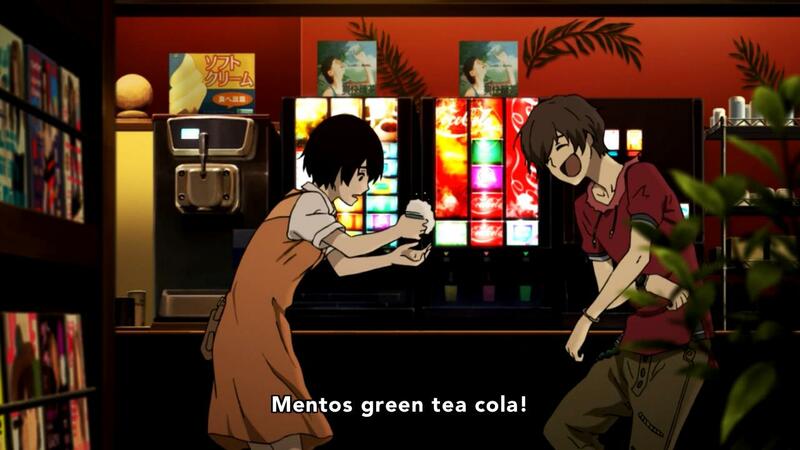 Zankyou no Terror Episode 3: First win? I guess this episode was supposed to show off Shibazaki as the new major opponent for Sphinx. It looks like he’ll be the “House” for this show, inspired at the last second with the key to each of the riddles…presumably, he’ll be the only one capable of standing in the way of our main characters. But I guess this week’s episode wasn’t really a victory for the police. This week’s bomb seems to have just been a test from Nine to see how much the police knew…just how overpowered are they planning on making these kids? I suppose it should be really hard to catch the main character (the show wouldn’t be much of a show), but they can’t win everything, right? And I’m still waiting to see how Lisa factors into everything. So far, her story seems to be just a completely separate thing. I guess she’s just supposed to suffer these first few episodes so that she’ll more willingly join the main characters. Also, judging by Nine’s constant flashbacks, I can’t discount the very high likelihood that the children from the facility will be involved somehow. But will they be allies or enemies? Author marthaurionPosted on July 25, 2014 Categories Zankyou no TerrorTags terror in tokyo, terrorismLeave a comment on Zankyou no Terror Episode 3: First win? Zankyou no Terror Episode 2: Save us, Shibasaki! You’re our only hope! Apparently, this Shibasaki guy is a pretty good cop if he’s being called to action. I’m assuming he left the police force after something went wrong in one of his cases. Anyway, I’m still curious about motives in this show…and also how the girl is supposed to factor into all of these things (she totally isn’t being forced to do this!). I definitely caught the small switch with the famous Sphinx riddle, where the two legs thing comes first, but I didn’t know that there was actually a second riddle that went like that, so I didn’t know the answer. I figured that the “man” answer was way too easy because too many people know that reference. What was up with the last line in the episode? Nine states that he is “waiting” for someone. Is he simply saying that he’s ready for the police to chase him or is there a specific target that he has in mind? And apparently, these two have plutonium now, so presumably they’re preparing to take these explosions to a nuclear scale. Nothing wrong with more explosions, right? Author marthaurionPosted on July 18, 2014 Categories Zankyou no TerrorTags terrorismLeave a comment on Zankyou no Terror Episode 2: Save us, Shibasaki! You’re our only hope!